Will New Urbanists Deliver A Home-Win With Miami 21? Miami 21, controversial for nearly four years and over 500 public meetings, met a critical need for citizens who were tired of the corruption and greed that seemed to result in an increasingly ugly, congested quasi-urban nightmare. Planning and zoning regulations, which were originally designed to protect property values, could be reinvented when enough power and money was at stake, and the code enforcers allowed more and more bizarre juxtapositions of high rises among low-scale residential neighborhoods. During the recent condo boom, variances became business as usual for the Miami City Commission and the Mayor. Now that the condo boom is over, it appears that both are rushing in to make amends to voters by passing this new form-based code. The code places height limits on neighborhoods similar to the old, Euclidean code, ominously named 11000. But this time around, uses are not segregated; instead, a mix of retail and other uses is intended to encourage increased pedestrian activity and a taking back of some of the city from the car. For citizens, there has been much to like about the arguments in favor of this code. As a result of the change, the pleasant weather that drew so many to the city will now perhaps be enjoyed on the boulevard; fear of shadows from looming high-rises will, according to the plan, now recede a bit. And a more organized, easy-to-understand building pattern should replace the Rube Goldberg-like zoning code full of special exceptions, arcane “bonus” rules, and a process all too easily subverted by tax-hungry politicians. With private development comatose, it is a perfect time for many jurisdictions to perform a much-needed overhaul of their development regulations. In the boom-bust atmosphere of Florida, most of the development industry sees this cease-fire as simply a pause to reload, and the Department of Community Affairs – Tallahassee’s growth management gatekeeper – is busy helping developers get ready for the next boom by making the Rural Land Stewardship Areas, a regulation designed to protect rural areas from development, officially optional. The American Institute of Architects chapter in Miami proposed to reform the old code, rather than start from scratch, arguing that the new code is complicated, fussy, and inhibiting. Reform of the existing 11000 code never seemed to be an option, and instead the Miami 21 code, written by New Urbanist gurus Andres Duany and Elizabeth Plater-Zyberg of DPZ, replaces the old code. Citizens of Miami, when presented with this new code, seemed ready for a change. Arcane spreadsheets, full of formulae and footnotes, have been replaced by transects. These silhouettes of buildings and streets – a sort of cross-section through the city – begin with the way a natural, un-built environment might look, progress to how a rural road looks, and go all the way up to how high-rise canyons might look. Patterning a city on a consensual, pre-approved notion of order is what New Urbanism is all about. There are no surprises – no high-rises in your backyard – but, as some local architects worry, there’s no spontaneity either. Walkability is another promise of the new code. Ideas such as transforming blank walls, promoting urban infill development, and lining parking garages with retailers, are all illustrated with magical dissolve images that change ugly parking garages into charming shopping districts. If it were only that easy. Transit-oriented development is a strategic goal of the code, creating density clusters that get people out of their cars and into alternative forms of transportation. Buses, bicycles, vanpools, and Miami’s Metrorail are closely interlinked with Miami 21. The marketing website for Miami 21 makes it impossible to be against the code. Opposing Miami 21 would be like opposing lifesaving drugs or opposing the blue sky. New Urbanism won this victory because there weren’t any compelling counter-arguments to their basic argument for urban hygiene. And Miami 21 comes at a time when the city has been egregiously abused at the hands of the free market; its citizens disenfranchised and suffering from an environment of ugliness, traffic and congestion. As noble as Miami 21’s goals are, however, they are only as good as the politicians in whose hands they will be used. Making new laws, rather than enforcing the old laws, is a favorite activity of politicians who, backed against the wall by irate voters, seek a grand solution. Much harder work will come when developers try to seek waivers against Miami 21, and if the history of Florida is any guide, it is not likely things will change much. For Miami 21 has some inherent costs that will split the haves and the have-nots of Miami-Dade County even further apart than they are now. 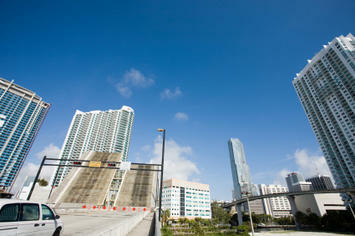 For the haves, the higher cost of development under Miami 21 is already a concerning factor. The code promises increased regulation, and the density transects favor already high-value districts. At the last minute, for example, City Commissioner Marc Sarnoff switched his support to be in favor of a 35-foot height limit in Miami’s MiMo historic district, to the chagrin of property owners seeking higher buildings. Whether he stays on one side of the fence, or switches back at the behest of a developer, remains to be seen. In Miami, the validity of New Urbanism’s principles of how cities are regulated will finally be put to the test. By spelling out the city’s form in detail, through technical images, watercolor perspectives, and mock-historical drawings, Miami 21 is illustrating a preordained vision of itself. The public’s trust in its elected officials has been so broken by the recent capitalistic building frenzy that, by consensus, an agreed-upon “ideal city” has been created on paper. Now it is up to the building officials to deliver this vision when the next building boom hits. Instead of exploring how to improve the planning process, as AIA Miami suggested, Miami 21 seems to have avoided confronting the planning and process issues that no one seems to know how to solve. Have our cities become so complex that we are unable to manage their growth through the traditional public planning process? An even bigger question is whether the village-planning model at the core of New Urbanism is a valid model? Will it achieve the lofty goals that have been promised? Miami 21 will be a fascinating experiment to watch during the coming years. Miami is already known for taking risks: it built an elevated rail system in a suburban, multipolar city and encouraged an international development binge that resulted in a dozen or two empty skyscrapers. Now it has added formal prototyping to its use regulations. As Miami 21 is implemented and tested, other cities like St. Petersburg, Denver, and Philadelphia are following suit, hoping that the increased regulations will be the quick fix needed to assure the public that the civic realm is being cared for. Submitted by arlington on Thu, 12/10/2009 - 17:23. "New Urbanism won this victory because there weren’t any compelling counter-arguments to their basic argument for urban hygiene." There were when people actually saw the hyper-controlled, sterile places it produced. We don't need anymore Kentlands, Seasides, or places that can serve as the set for The Truman Show. Real urbanism is lively but gritty, not filled with Panera Bread franchises you can walk to, or mall cops whose sharpest weapon is a walkie talkie antenna. Yet this is what much of new urbanism really is - a lot of architects and planners patting themselves on the back for re-creating Disneyland instead of Levittown, along with a heavy publicity campaign from DPZ. Miami already has over 10k people per square mile, it cannot upzone its way to urban sophistication, or worse, place heavy restrictions on zoning so that you get a creepy Reston, Virginia effect - where the "city" is funded with outside capital, filled with more franchises than you thought existed, and contains as much charm as the food court at the King of Prussia mall. "For Miami 21 has some inherent costs that will split the haves and the have-nots of Miami-Dade County even further apart than they are now." Especially around Coconut Grove. New Urbanism and homeless people don't normally go together, and not like the city isn't already concerned about tourists getting mugged near the Coco Walk. Basically Manny Diaz allowed DPZ to come in and re-write Miami's zoning laws. If you get a few parks or sidewalks out of it, then no harm's really done. And considering DPZ's habit of creating more news stories than actual places for people to live, I doubt the impact of Miami 21 will really be that noticeable.